Each of our templates come with a pre-built navigation menu that is easy to modify and change to meet your site's needs. When the "Page" button is chosen, a new page will be created in your site. You can go back to that page to add content and edit later. You will need to name the page. You will have the option to make this your home page if you like. Just click the check-box that says "is home page" then click save and the new page will be created and automatically incorporated into your websites navigation. 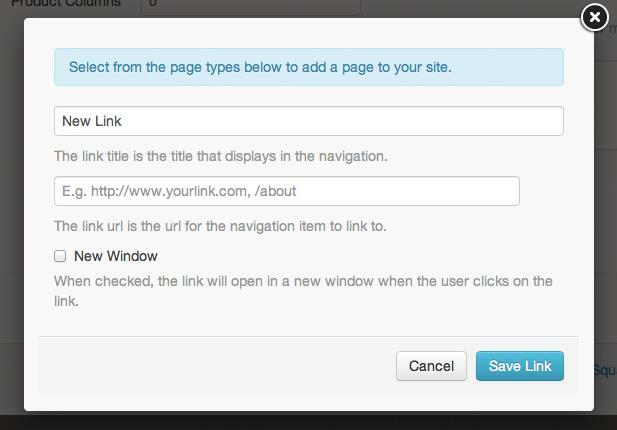 When you choose the "Link" button you will be prompted to create the name you want to display in the navigation. It will also create a URL that will then go to the web browser when the user clicks on your link. There is a check-box that allows you the option to have the link open up in a new window in you browser, if you desire. When you select the "Blog" button is chosen, you will prompted to create a new blog. You will need to name the blog-which will also create a url. From there, you can decide whether you want incorporate an already existing TUMBLR or BLOGGER account or create a SquareHook Blog. When the "Portfolio" button is selected, a new gallery will be created. You will need to name your portfolio gallery. Once named, you can add as many images (with descriptions and tags) as you'd like. 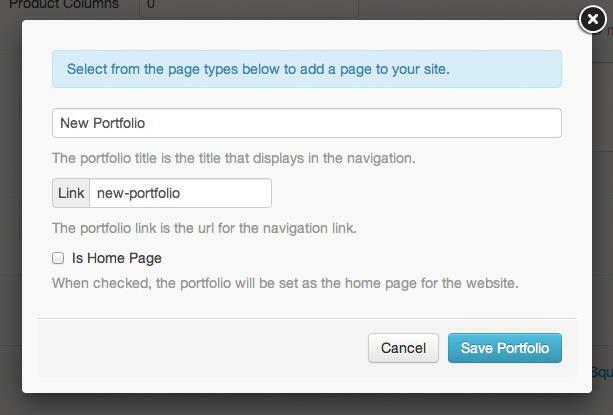 You will have to change the layout to portfolio to setup the functionality of an interactive gallery. When you choose the "Products" button, you will be prompted to name your store. You will then be able to choose the number of products you'd like displayed, product columns, page content, and if you have categorized your products you can specify the category you'd like to display. 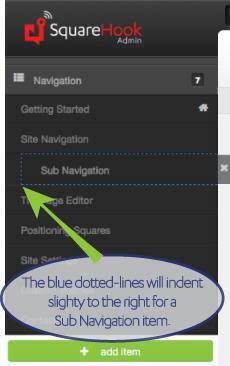 It is very easy to create a subnavigation. Similar to adding a page and arranging items in the navigation, you select the page item you want. As you move, the selected item will be indicated by blue-dotted lines. We refer to the blue-dotted lines as 'drop zones.' Then, move the item directly beneath the navigation item you want it to be a child of. While the page item is still selected, slide your mouse over to the right and you will see the blue-dotted line slightly indent to the right which indicates that it is a child of the item directly above it. For your site you may want to have a page that is connected to your site, but is not visibly shown in the Navigation. You can create this type of page in the "Linked Pages" section directly below the Navigation tab. 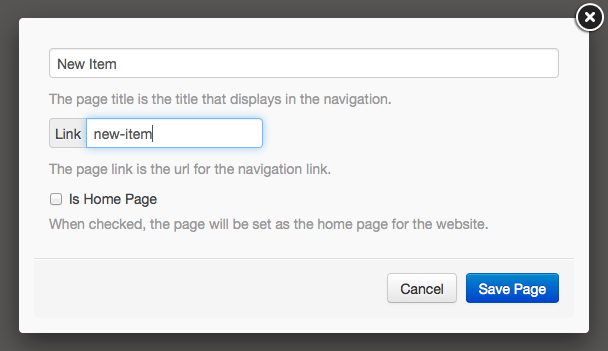 A linked page is created the same as a navigation page, but will not appear in your site's navigation. If you do want your linked page to become apart of the navigation, it is very simple to drag a page from "Linked Pages" into the Navigation tab, without having to recreate the page. You can also move a page from the Navigation tab down to the "Linked Pages" tab so the page exists, but is not currently viewable on the site's navigation. 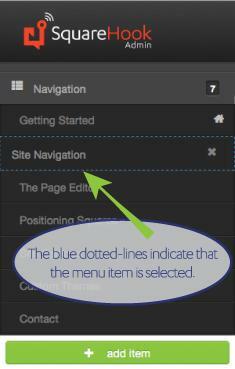 Helpful Hints to Adjusting the Navigation of Your Site.